Talking to Tootlafrance last year, Christian Marie of high-altitude resort Alpe d’Huez spoke about the increasing use of satellites in optimising the snow cover for ski resorts. Such is the success of these projects that they are now being used more and more in the management of snow cover in the top resorts in France and across Europe. SNOWsat is one such system that allows ski stations to measure the height of the snow cover and to optimise the use of piste-bashers. Piste-bashers are those enormous machines that crawl all over the slopes at night whilst everyone else is asleep and/or drunk, preparing the pistes for the next day’s skiing. Typically in a large French resort, they run in a couple of shifts – from about 17:00-18:00 to midnight or 1am and then from about 02:00 to 08:30, leaving the place brushed and levelled as if nobody had been skiing the day before. The cost of running these monster machines is considerable. They also operate in the dark so they need to know where they’re going, particularly in blizzard conditions. As such, they have been using GPS devices for years but with the latest technology, they not only navigate but the fleet of piste-bashers is also guided into the areas where they are most needed and away from the ones needing only minor adjustments, according to the snow accumulations, usage of skiers and wind directions. Most skiers probably take little notice at just how well distributed the snow is day after day on the modern ski slope but it’s all down to this type of technology. In Val Thorens, for example, the organisers say that they could never have organised the 2015 World Ski Cross event without the use of the SNOWsat system that allowed them to optimise the snow cover for the event. 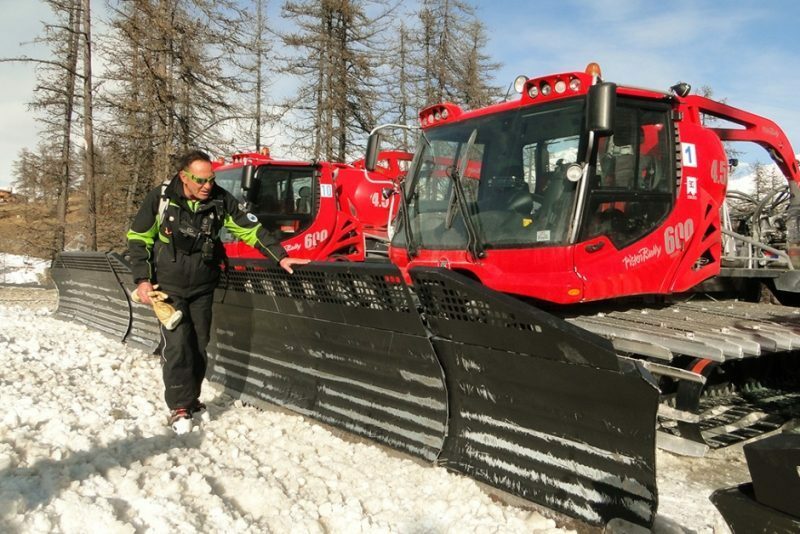 Along with German piste-basher manufacturer Kässbohrer, SNOWsat and Alpe d’Huez have been working together to perfect what is widely regarded as one of the best such systems in operation. Receptors on the piste-basher collect information that allows the machine to relay its precise location in relation to natural snow cover and to the other machines in the fleet. The system has already an integrate digital 3-D map of the mountains that includes up-to-date information on snow cover and depth. Both the piste-basher drivers and the control centre of the resort have access to the information, allowing highly precise manoeuvres that are done with almost infallible efficiency. For the resort, it means a significant reduction in fuel consumption (-8%) and manufactured snow (-15%)as well as getting the job done a lot quicker (-5%) and with a more even result, according to SNOWsat. For Kässbohrer, the SNOWsat sector is the fastest-growing in their company and they estimate that it will represent about 5% of their turnover between now and the end of 2017.